What does it take to build a product development team that provides real value to a client? And what are the most important considerations for each discipline – engineering, product, user experience – to spend their effort on in a way that will help both their team members and the client? 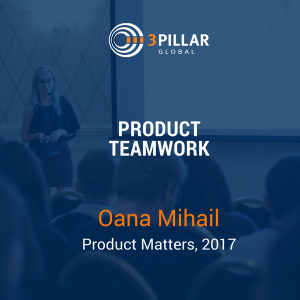 3Pillar Global’s Oana Mihail spoke about those topics at Product Matters, a product-development focused event that was held on September 7th in Iași, Romania as part of the opening of 3Pillar’s new office there. Understanding and research. The goal here is to gain a deep understanding of a product’s users. Typically this is done by observing people using an app or product in real time and with user interviews. Defining the issue. In this step, the team is focused on synthesizing all the information gleaned during the understanding and research phase and coming up with a concrete problem the user has that they can solve for. Ideation. Once an issue is defined, we go into the idea generation phase, placing an emphasis on quantity over quality. Testing. Once a prototype is created, it’s time to test it out with some of the audience for which it was created. This is another key phase where unexpected innovations and discoveries often occur. If you’re interested in hearing more, including the various component parts of what constitutes a “team” at 3Pillar, you can watch the full video of Oana’s presentation via the YouTube embed below. Oana is a User Experience Designer and full-time creative thinker at 3Pillar Global, where she is focused on visual and interaction design. In the last five years of her career, she had the privilege to work with exceptional clients from areas such as media, services, and commerce. Her constant curiosity of how colors influence core human emotions was the starting point of her career as a graphic designer. To this day, color theory is one of her favorites tools she uses from her awesome toolbox of skills. “Product Matters” was the first 3Pillar tech event in Iași, Romania, and it coincided with our office opening in Iași. Product Matters saw a number of talks from 3Pillar executives and product leaders on recent technology trends, learning the Product Mindset, and understanding how teams can work together to compete and win in the digital economy. If you like Oana’s take on product teamwork, please help us spread the word about her talk! In the next minutes that I will spend with you together, I will try to share with you some interesting information about the product creation life cycle and our team structure, roles and collaboration here in 3Pillar. First of all, thank you so much for joining in such a big number. It’s so good to be back here, as Bogdan said. This is the place where my career actually started because I finished George Enescu University of Arts here and right now I’m working as a UX designer in, I have to admit, the most amazing team I’ve worked on. If you look around us, everything is evolving. We now have smart gadgets, electric cars, clever apps for almost everything. We even have talking robots. Same as us, the tech industry is constantly in an evolution. We are a part of this growing, changing community that is creating new habits and new ways of working together. The best thing is that we are able to adapt and we are constantly growing, adapting, changing. I think we start every project with a common mindset to engage with our clients, to make them our partners, to try to give them professional advice and recommendations, to help them grow and be successful. This is the most important part. We engage with them. What we bring to the table is the consultative approach, how we see things. We often try to advise them, to help them grow, to make the best decision for that product. From my experience, what most successful partnerships have in common is the honesty, the trust and the shared vision. Very important, never stop learning about your partners or about your clients and about their businesses. In our teams here in 3Pillar, we are adapting. We are engaging with them. We are making a commitment to understand the business, to drive the work, to manage the feedbacks. This is a part of making them successful. A key point that we add to the partnership is the voice of the user. In other words, user-centered methodology, which is a great thing, is about seeing what the user needs and putting the user needs before. Also, keep in mind the business’s needs. As a company, we bring the consultative approach. How we make our partners successful depends on the department. For example, the engineering team will always try to make the app performant, scalable, faster. The product team will always understand the business, understand the user needs. As UX designers, as I said, we are bringing to the table user-centered methodology. We are trying to understand the user needs and the way that the user is familiar with the product. Knowing the audience is one of the keys to make a product successful. If we take that into consideration, our product will be efficient, will be satisfying, will be user-friendly. Our partners will have more engagement from the users and more user satisfaction. That will increase sales and loyalty from the customers. Let’s see which are the key steps into creating a product. First of all is understanding and research. In this step, this is the first step, and every project should start with those two things in mind, is to gain a deep, empathic understanding on the user, on how the user will use that specific product, that specific feature or app. We should observe and engage with them. How can we do that? Through user interviews mostly. It’s that part where we are talking directly with the user and we are asking things that can help us create something reliable and usable. It helps us to understand the behaviors, the needs and motivations. We are using tools for analyzing the user needs and the user behaviors. We gather all that information. We are now moving to the next step, which is defining the issue. This step is all about taking all the information in the previous step and seeing and understanding what’s next for the user. We are starting this with one question in our mind, how we might do that specific action. We move on to the third step, which is ideation. Here in the third step, it’s all about generating lots and lots of ideas. It’s always quantity over quality. After that, as a team we sit down and decide which is the best, most useful solution for our problem/issue. Then after ideation, we move on to prototyping. Prototyping is that part where, for me, I like it so much, the product is brought to life. We bring life into that product, into that feature. This step also leads to discoveries and innovations because we see the product from the inside. We see the features. We see the flows. We see the architecture now. The prototyping, it’s a way to explore ideas, to explore our ideas from the ideation stage. It’s where we try to fail faster and succeed sooner. The last step in the process is testing. Testing is one of the most interesting parts in the process. It’s the final stage, but also in this stage the results often lead us to different approaches and unexpected innovations and discoveries. In this step, alterations are always made. Now that we saw which are the key steps in our product creation, let’s see how we collaborate as a team. In 3Pillar, we have a lot of roles. We have big teams of people. I was thinking the other day, right now this is the third project I’m working on in the past two years since I joined 3Pillar. Every team was different. There are multiple roles, but one common thing is that we start every project with a mindset to deeply understand the needs of the user, to try to make the clients, the partners successful. We can just list a bunch of roles, and depending on the project needs, we can mix and match. For example, we have the engineering team, which is led by the Engineering Manager. We have Technical Leads. We have developers, Front-End, Back-End, Android, iOS, QAs. Then we have the product team. In the product team we have Product Managers, Business Analysts, we have User Experience designers. We all gather. Let’s imagine that someone wants to build an app for financial management, let’s say. What’s the next step? The team members are now gathering in the first meeting of the project. This is the kickoff meeting. In this meeting, the team members get to know each other because our teams are a mix between, I don’t know. I’m working in Cluj but now we have offices in India, in Timisoara, one in Iași. The teams are often mixed. In the kickoff meeting, we are meeting our colleagues. We try to see which are the commitments, which are the things we need to solve for that app that we are trying to build, which are the milestones, the risks. We try to take them into consideration. Then the next step is the kickoff meeting with the client. This is really important because in that part of the project because the client gets to know us and we get to know the client and manage the expectations for that product. After that we start with the first stage in our process, which is research. We have user interviews. We have analyses made on the product. We gather the results and then we start to ideate. What’s very important is that every opinion from the team is heard. Anyone who has something to say, every opinion is taken into consideration. Then we sit down after ideation and we decide which is the best, most useful solution for us. Then we start to prototype. This is the point where the User Experience designers jump in the stage and they bring life into the product. After that, testing. That often leads to unexpected discoveries and innovations for the product. Even if the tech world is constantly changing, we try to adapt and work as a team to build successful, great products together. I have to admit that here is the best team I’ve worked with since I first started my career.